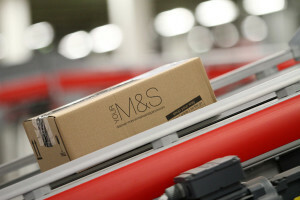 Marks & Spencer has completed an investment at its huge Castle Donington distribution centre to improve immediate capacity issues through peak trading, the company said as it set out plans to re-engineer its end-to-end supply chain. Releasing its half year results, it said that further investment at Castle Donington would be needed next year to meet its growth plans to 2021, “after which additional despatch capacity will be required”. Like for like sales in the Clothing and Home business were down 1.1 per cent in the first half, while like for like sales in Food were down 2.9 per cent. The retailer, which is closing 100 full-line stores, has put in place a process to re-engineer its end-to-end supply chain to remove costs, complexity and working capital. It has targeted cost savings of at least £350 million. Key to the strategy is to become “a digital first retailer”, it said. “Our web site and online fulfilment capability remain well behind the best of our competitors. However, very early steps to improve our web site have helped deliver UK Clothing & Home growth of 9.1 per cent online, with clothing growth ahead of the market, and further improvement has been seen in recent weeks. The retailer has set out plans to save at least £350 million by 2020-21, and said it was maintaining its guidance of up to one per cent reduction in full year UK operating costs this year. “The closure of marginal low contributing stores and the rationalisation of unprofitable categories and ranges will in time unlock significant cost, margin, working capital and maintenance capital savings. These include an improved shape and depth of buy reducing the cost of singles handling and stock clog in Clothing & Home. Improved rates of sale in Food will reduce unnecessary waste and through our closure programme we will eliminate the facilities maintenance costs of out-dated equipment in legacy stores. In both Clothing & Home and Food businesses the supply chain infrastructure is well short of state of the art, management has been fragmented, and consequentially stock levels, availability, markdown and waste all remain at uncompetitive levels, the retailer said. “However, comprehensive programmes including “Fuse” are now underway to implement end to end changes supported by expert outside advice. “In Clothing & Home, stock carrying levels remain at c.20 weeks and availability remains unsatisfactory. Supply chain and store operating costs are impacted by the complexity of stock handling and the volume of slow-moving lines. The initial assessment of Clothing & Home “Fuse” is promising, with significant reduction in stock and cost to operate. In physical distribution we are on track to open a further national distribution centre at Welham Green next spring and this will allow us to increase our single tier network coverage to c.85 per cent. For the half year to 29th September, group revenue was down 3.1 per cent to £4.97 billion. Group operating profit before adjusting items was down 1.4 per cent to £262.5 million.